In order to help the people of Haiti respond to this catastrophe, Google is donating $1 million to organizations on the ground that are rescuing those still trapped and providing clean water, food, medical care, shelter and support to those affected. We'd like to make it easy for anyone moved by the tragedy to respond as well, so we've included a link on our homepage to information, resources and ways you can help, including information on how to donate to organizations including: Direct Relief, Yele Haiti, Partners in Health, Red Cross, World Food Program, Mercy Corps, Save the Children, Lambi Fund, Doctors Without Borders, The International Rescue Committee. You can also use the below buttons to donate to UNICEF or CARE. In addition, Map Maker data has been made available to U.N. organizations and the team is working with the Map Your World Community to encourage Map Maker users with on the ground knowledge to help update the map of Haiti with disaster response data. We've received requests from relief organizations and our users to publish recent satellite imagery of the country. 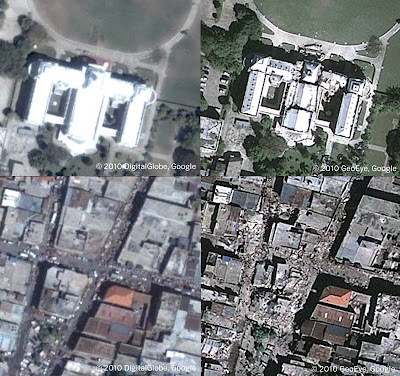 One of our imagery partners, GeoEye, has provided us with post-earthquake imagery from Haiti. You can check our Lat Long blog for further updates. We've also reached out to the YouTube community for help. A Spotlight on the homepage drives traffic to videos from Oxfam and the American Red Cross, where you can make donations to relief efforts. We're also keeping a running playlist of the video footage coming out of Haiti on Citizentube; you can find a broad collection of citizen reports, news wire clips and personal stories of some of the victims. Update at 1:11: Details regarding YouTube involvement corrected.